더들은 흥덕에 있는 마지막 컨트롤을 거쳐 남쪽으로 이동했으며 내장산을 지나 광주로 돌아왔다. 이 마지막 코스에서는 강풍으로 인해 몇몇의 라이더들은 자전거에서 내려 걸어서 올라갔다. 그룹 1 (Chikara Iwamoto, Jan Erik Jensen, Yutaka Moriwaki, Park Insoo - 박인수 and Wang Tae Ryung)은 자정이 되기 전에 주행을 마쳤으며, 그룹 2 ((Russell Hamilton, Han Soon Kwon - 한순권, Lothar Hennighausen, Lee Dong Ho - 이동호 and Ulrich Schoenemann)는 3시간 후에 도착하였다. 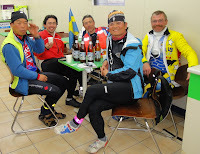 Eleven Randonneurs took on the challenge and rode the inaugural Korea 1000K Brevet that featured Korea's southern and western coastlines (Google map). 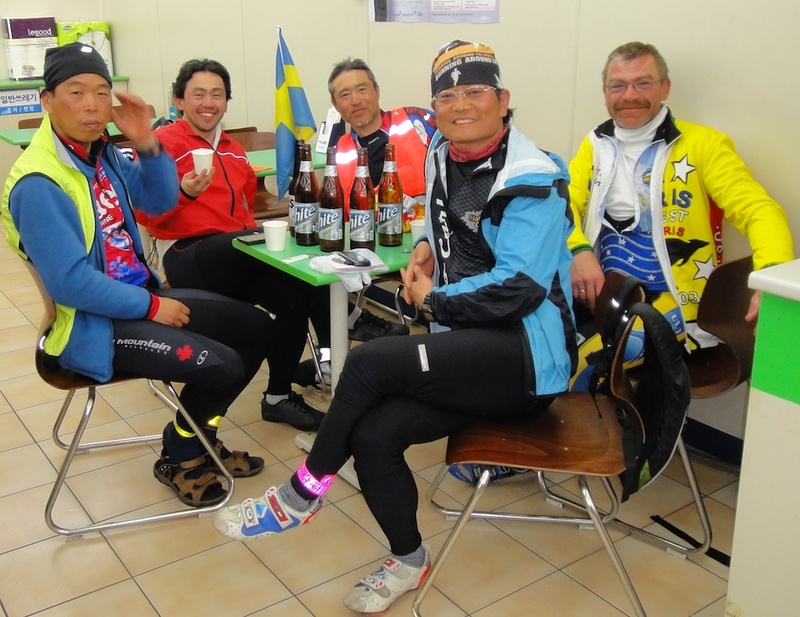 In addition to five Korean riders, Randonneurs from Australia, Japan, Sweden, Germany and the US were at the start. Strong headwinds on long stretches of the ride, relentless rollers along the coastline and the ability to navigate unknown countryside with its myriads of farm roads made this ride a challenge. In the end, 10 riders finished within the time limit of 75 hours and took home a new sense of an enigmatic Korea. Congratulations to all riders! From the start in Gwangju at the crack of dawn riders headed east into the rising sun towards the Jirisan to the first control in Gurye. 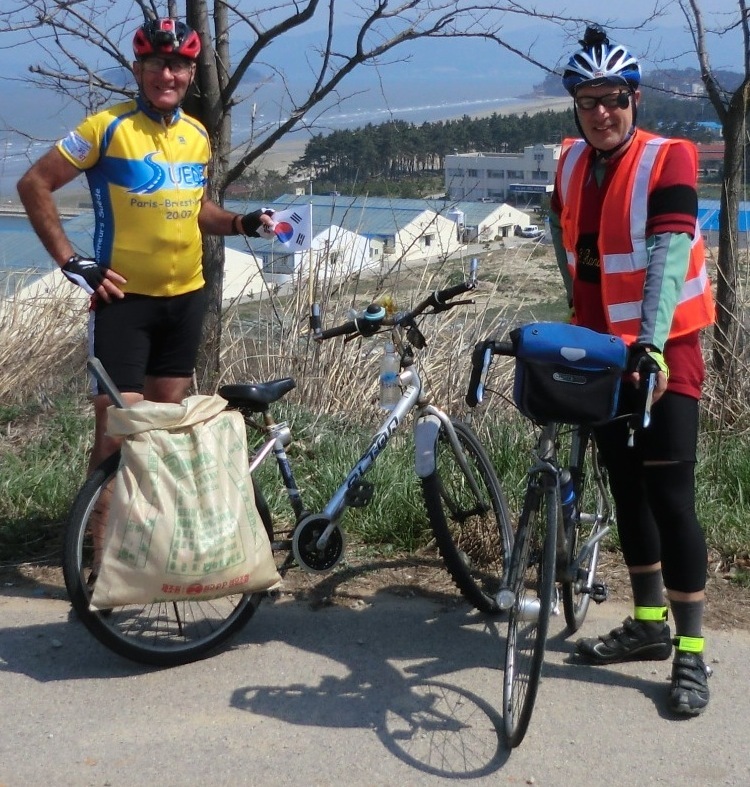 From there cyclists followed the Seomjin River and reached the southern coast in Sacheon around noon. After crossing most spectacular bridges they meandered along the shores of Changseon-do and Namhaed-do. At Beolgyo night had swallowed the riders and the 24h Sauna in Yulpo was the perfect place to recover and get ready for day two. Cycling west from Haenam to the port city of Mokpo on day 2 was accompanied by fierce headwinds. After reaching the yellow see at Mokpo, Randonneurs turned north and enjoyed a spectacular sunset highlighting coastal structures and islands. Day 3 featured several info controls to keep riders along the shore and the 32 long Saemangeum Seawall with a boosting tailwind. 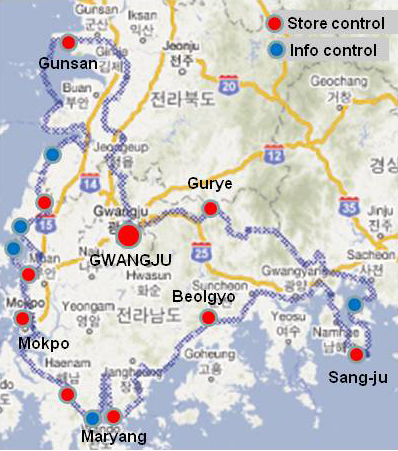 From Gunsan riders headed south through the last control in Heungdeok and over the Naejangsan Mountains into Gwangju. Gale-force winds on these last climbs forced some riders to dismount and walk their bikes. 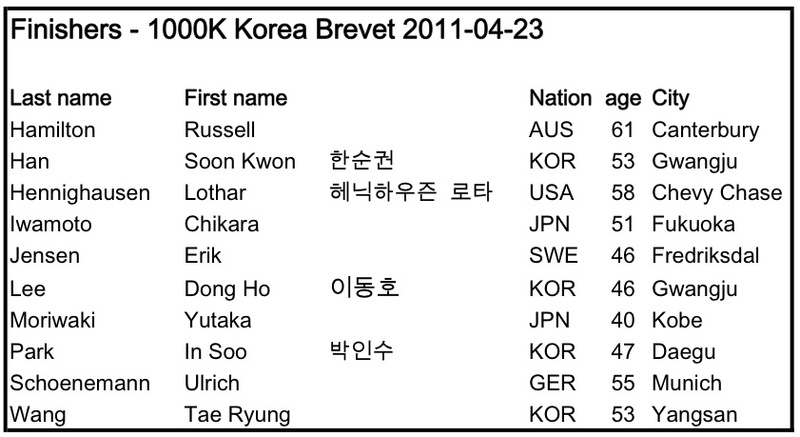 Group 1 (Chikara Iwamoto, Jan Erik Jensen, Yutaka Moriwaki, Park Insoo - 박인수 and Wang Tae Ryung) finished just before midnight while group 2 (Russell Hamilton, Han Soon Kwon - 한순권, Lothar Hennighausen, Lee Dong Ho - 이동호 and Ulrich Schoenemann) arrived back in Gwangju with more than 3 hours to spare. It is crazy to ride 1000km. Only those who had experienced 1000k riding know its pleasure. Anyone who is interested in riding can challenge. I would like to share this happiness with all of you. .... Russ Hamilton and Ulrich Schoenemann on the climbing of the 1000K.